We’re holding the following scheduled classes OUTSIDE this week! We’ll be practicing on the green at South Fistral Esplanade, just down from the studio. See more info and class descriptions below… Keep posted as if the weather improves, more classes may be added! 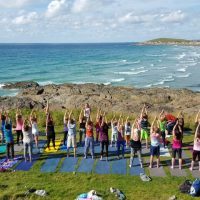 Meet down on the grass outside the Fistral Beach Hotel instead of the studio to sign in…..Free parking along Esplanade Road in marked bays 🙂 Bring along a mat if you have one! Suitable for all levels. Drop in £8 or use your membership block. Card payments taken online before class, cash if dropping in please! relaxation to gather the benefits of the physical work. Suitable for all levels, those with some previous experience of yoga or a good level of fitness looking to combine yoga into their routine. before coming to ENERGISE to get a solid foundation into your yoga practice. FOUNDATION – Suitable for beginners or those looking for a more alignment based flow practice. A slower paced class that focuses on correct alignment and getting the most from your yoga practice. will help to bring a sense of calm and well-being to body and mind. practice! Suitable for all levels.